What an amazing, outstanding, bizarre and thrilling night we had yesterday. 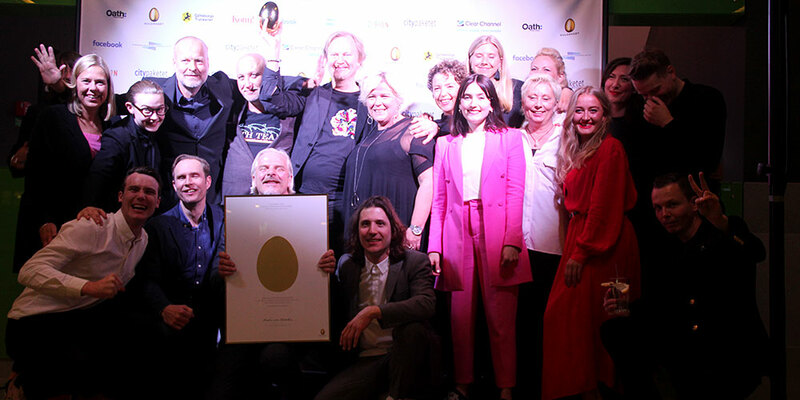 Last night was the Golden Egg awards, Swedens most prestigious advertising awards. Åkestam Holst was the clear favorite for the night, as we started with the most nominations – 23, all in all. But as seasoned pros, we know that nominations seldom lead to awards, and just being nominated is the greatest honor. So we kept our cool, and lowered our expectations. And then we started winning. And kept winning. The total final tally for Åkestam was seven Golden Eggs and Ten silver eggs – meaning half of the 14 Golden Eggs awarded in total. A record-breaking victory – the best in Åkestam Holst’s history, and in the last decades of the competition. Right now we are so incredibly happy, humbled and proud. Not to mention monstrously hungover. But mainly proud – over the amazing teamwork and dedication from the people who brought us here, and the brave clients and supporting partners who made it possible. We’ll take some time to celebrate and digest this, but try not to let it go to our heads. ”Once again, I would like to underline how easy it is to get hubris from awards. It’s a nice confirmation that we’re doing high-quality work, that’s ranked highly by the experts in the jury.